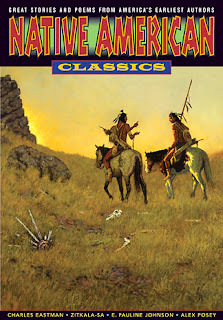 Eureka Productions has just released its twenty-fourth volume in its Graphic Classic line, Native American Classics. It should come as no surprise that it's an anthology of works by and about Native Americans. Like their African-American Classics which I reviewed last year, the stories and poems here are generally taken from the earliest published Native American authors and adapted into comic form by contemporary creators. In several cases, the stories are much older, harkening back to various oral storytelling traditions, but the versions here are from published accounts. Given the time period most of these stories were originally written, it should come as little surprise that many deal with issues surrounding how the white man invaded their land and coralled them into small areas. But what's extremely interesting to me, and very telling of their cultures, is that the stories don't really reflect a great deal of anger. There's some sorrow and resignation, but no sense of hatred or retribution. The notion of rising up against those who treat them unfairly is almost wholly absent here. I think that, even if many people don't know the specifics, they're at least vaguely aware now that Native Americans got royally shafted by the US government repeatedly over the years. Hell, we were even taught a surprisingly unvarnished view of the "trail of tears" 30 years ago when I was in grade school! But what's not talked about as much is a notion that's brought up a few times in the book. Namely, that while the relocations and broken treaties were terrible, the real affront was having Christianity forced upon them, and being told their religions, languages and very way of life were wrong. But even then, with a mandatory assimilation, there was no anger, just sorrow. That was something I certainly hadn't given much thought to -- that a religion very different than their own was forced on them, and that was more wrenching than losing their hunting grounds. Like any anthology, the quality and style of stories varies a bit from one to the next. Some are elaborately painted, some are cartoons. Some are allegories, some are origin tales. I will say that I found them to be overall of a higher calibre than I saw in African-American Classics. If this volume suffers from any real problems, it's one that's not dissimilar to one I tagged to Trickster, another anthology of Native American tales from a couple years back. That is that Native American storytelling doesn't necessarily follow the same conventions as Euro-centric authors, and some of the stories take a bit of a mind-shift to better appreciate. Though I will say that it wasn't nearly as pronounced as in Trickster so it would be even less of an issue here. One other minor issue I'll point out, but this might just be part of my personal pecularities. While it's not critical for an understanding of any of the stories, I would've appreciated some notation of the tribal affiliations of the original stories tied more closely to the stories themselves. The short author biographies in the back make note of the affiliations, but I would've liked to have seen it presented at the start of each story somewhere. Some do mention it in the context of the story, but that's just based on the individual creator, and accordingly not very consistent. Not a big deal, but it's a small piece of information I would've liked to had more upfront. Speaking of creators, it should be noted that contributor Robby McMurtry died shortly after completing "On Wolf Mountain" for the collection. Editor John Smelcer has pledged one dollar for each book sold through March to the Robby McMurtry Scholarship for the Arts. If you're a regular reader to this site, you'll know that I'm all for comics that open me up to new and/or different cultures and approaches to the world. This book very much does that, and in a way that's more visceral than the much-lauded Trickster. Native American Classics is available now and retails for $17.95. The publisher provided me with a review copy.